Now is the time to be collecting your sweet chestnuts.As the October winds get going, there will plenty more of them to collect from under the trees. Don’t confuse them with horse chestnuts (conkers), which are inedible. 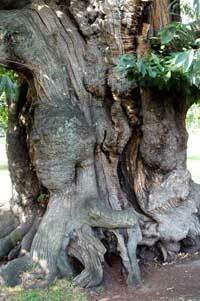 You can see pictures of the sweet chestnut tree in the Woodlands.co.uk Tree Identification Guide.The hedgehog-like cases are covered in long, pliable, green spikes. Split open, they contain 2-3 shiny, roughly triangular nuts with a distinctive tuft on the end. I found some sweet chestnuts in Bristol in Leigh Woods, near Clifton Suspended Bridge, I’m planning to roast them. 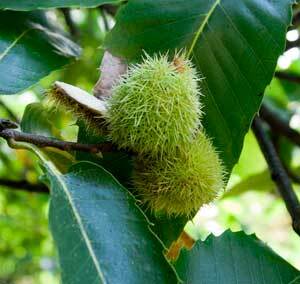 Want to take my kids sweetchestnut picking we live in Middlesbrough ( northeast). Can anybody tell me where I can go and pick them from ? Clophill ( Back Street), Bedfordshire is a good spot for sweet chestnut foraging. I did last week after Storm Bryan. Just gathered over 3Kg of sweet chestnuts. It must be a mast year.Looked on line for easiest way to peel and skin them. I tried various suggested methods and found the trouble with cooking them first makes them crumbly when you try to handle them, so I experimented a bit and found the quickest, easiest way, plus preserving your thumb nails is to cut off the pointed end with a sharp knife and with the knife, gently peelback the shell. Put the chestnuts into a pan of water. Don’t worry about the inner skin yet. Once you have a batch (it’s difficult to know when to stop, as peeling, like gathering gets very morish), just bring them to the boil and remove from heat but leaving them in the hot water – take them out one by one (with rubber gloves) and rub off the skin. Most will come off instantly but if you get the odd one that sticks a bit (the very fresh ones with thinest skins seem to be a bit more clingy by this method), just pop them back in the hot water and if necessary, heat the water again and have a pointed knife handy if the skin gets stuck in a ridge and needs easing out. I can’t wait to gather some more now that I know peeling them is so easy. Oh and once they’re blanched they freeze quite well.